Sunday is a Day of Rest Isn’t It? There is the mistaken impression that for a modern economy to work efficiently, everything must be 24/7. Missing a beat is considered fatal to good business and economic productivity. All must be frenzied and hurried if one is to compete in today’s globalized economy. Such assumptions go against the necessities of human nature. People are not machines. They need to stop and rest. If society is to return to some kind of order, people must be convinced that things can stop. Things should stop. Things must stop. This is not some wistful desire for simpler times of the past. Stopping can be done today and a good example is found in Germany. They call it “sonntagsruhe” which in German means “Sunday rest.” Germany, the world’s fourth largest economic power, stops on Sunday. It should be emphasized that stopping on Sunday is not optional in Germany: one must stop on Sunday. The “sonntagsruhe” is not just casually staying away from work. Rather, the long-established custom keeps most shops closed and noise levels down. Even lawnmowers and leaf blowers must fall silent so that all might enjoy their rest. Loud music is restricted. Heavy trucks are banned from the highways to prevent unnecessary noise – and give truckers a much needed break. The system is set up so that one has to stop and get some rest after an uber-efficient workweek. The hard-working Germans on their part enjoy the weekly respite. It provides an opportunity for them to concentrate on unwinding, indulge in neighborly considerations or enjoy a good stein of beer. During their Sunday rest, Germans take to the outdoors, visit family and friends or (unfortunately, less frequently) attend church. So enshrined is the national appetite for Sunday rest that repeated efforts by retailers and businesses to loosen the rules have ended up in failure. Some German states allow occasional Sunday openings for special shopping events and seasons, but most commercial Sunday activity is restricted by law… but also by choice, since the Sunday rest appears to enjoy widespread popular support. Such stopping has not jeopardized the national economy as Germany is the enviable economic powerhouse of Europe. Of course, America is not Germany. While it can be admitted that most people still have Sunday off, it has become much more a day of shopping and activity than of rest or spiritual edification. Indeed, it was not too long ago that America had its own “Sunday rest.” Things simply shut down so people could be with their families. A few essential services stayed open, as they should. Back then, the seventh day was generally dedicated to God and those relationships that really matter. The key to some kind of return to order is not to legislate some kind of “sonntagsruhe” upon the American populace. Rather it consists of understanding what happened that changed mentalities so drastically and then questioning the prevailing attitude. The result is an anything-anywhere-anytime economy where all can be had at the click of a mouse or the swipe of a card. It is a frustratingly frantic system, in which people forever want more, yet never feel fulfilled. Indeed, all might be had in such a world, but much has been lost. What must be questioned is if this world where people are always connected to frenzy is desirable. Tethered as they are to their electronic devices, people no longer free themselves from the stressful demands of daily life that follow them everywhere. They no longer have or take the time to consider what Notre Dame Professor Brad Gregory calls those important “Life Questions” where the meaning and purpose of life are considered in silence and peace. This same connected world keeps individuals disconnected from the necessary links to family, community and faith that keep a society in balance and support individuals in their journey through life. It favors a collection of extreme individualists who are terrifyingly alone together. It is no wonder that there is so much anxiety in modern society. What needs to be done is to challenge the myths that say things cannot stop and a return to order is not possible. Things can stop and it is time to have the courage to challenge the frenzy. Indeed, today’s stressful 24/7 world is in dire need of a Sunday rest. This entry was posted in Featured and tagged America, brutal pace of life, Christian principles, Return to Order by John Horvat II. Bookmark the permalink. Blue Laws need to be implimented again. Thank you so much for this article , I agree with the points above. What many business people and Gv, ignore is , that we are beings with spiritual needs , means we need to cut off at least once a week from stress from too much concentration and tensions during the week days. Did anyone observe how much stress many employees have during the working time in markets and many sales shops ? I know that very well because my two daughters work in sales departments, and they are longing to have a free day where they can relax from all the stress and tensions accumulated during the work. I experience the exploitation in the ecomic system people must buy more and for that reason we must produce more and more hours working .. but as you know many of this business people they have a life of luxus and that is the evil behind of all this economic power , the rich become more rich and the poor people stay poor and this world is so unbalenced. To have a free sunday it is neccesary for everyone it should not even be a question about it, since we are not robots or machines who are slaves of an economical tyranny as we are forced to be in this exploited society. People forget about our spiritual needs and tend to focus on physical level as this is the only thing that we live for .. we need air we nedd oxygene and we need love we are beings with all those needs but our society is pushing us to forget all the values we are here for. I will never support any law who pushes people to work on sundays ,, we can protest about it and make as many petitions neccesary to stop this modern slavery. Thank you so much for giving me the oportunity to share my opinion . God bless !! This would be against the constitution which says no religion should be put above another by law. What about Jews and others? Changes in temperament are always made better with the arrival of a new baby! God bless! Read a book on a Sunday afternoon — why not? And get away from the screen. You can’t hear God amid all the noise — God is best heard in silence, especially at Adoration. together, it DOES NOT constitute Family Togetherness. The Gov’t, along with Gov’t Schools are DESTROYING THE FAMILY, AS WE KNOW IT……No JESUS no Peace…….Know JESUS, Know Peace. So how should we make sense of Jesus’ comment on “The Sabbath is made for man and not man for the Sabbath” ? So, if I read you correctly then those who wish to work on Sundays are serving others in need ? Thus why impose Sunday as a day of rest if some people wish to work ? The Spirit of tender loving-care is more important than the letter of the law, otherwise doctors, jail-guards, etc. could let all hell break loose. This was Jesus’ example of rescuing the your “ox from a ditch”. More important than that, Sabbath is Biblical and Sunday is counterfeit. Sunday is a countfeit Sabbath, but overall we agree on helping others. And helping others is what Jesus was all about. Amen. Sunday, is a day of rest, according to the what law? Simply put, Sunday was set aside as a day of rest & worship by the early church. This tradition was set when Christ’s resurrection (on a Sunday, Matt 28:1)as well as his continued appearances on subsequent Sundays (john 20 :26) and, finally, the descent of the Holy Spirit (Acts 2:1). This pattern was set and hence followed by the early church fathers. You can always check with any Catholic priests for verification. I was raised Baptist, then became Atheist as a young adult. After 30 years old became a 7th Day Adventist. I only asked for a law because you mentioned one, and I enjoy Bible research. I have no interest in priest views nor traditions, but thanks man. The so-called laws are traditions set by the early fathers or apostles who followed Christ. That’s why the Catholic Church is called an Apostolic Church. I don’t see how this pertains to Sabbath & Sunday, but you have free-will. Everyone has free-will, it’s a case of whether one follows traditions or reject them. Should one reject tradition where does one begin ? I simply value God-made laws & not man-made traditions. But those laws became traditions , no ? Such as the 7 sacraments which Christ began teaching and later the early church called them “sacraments” for example. The Sabbath is a God-made law, and Sunday is a man-made tradition. The Sabbath was overturned by Christ simply on the basis of acts of mercy. While Sunday, although a tradition made by the early church, is a Holy day based on the resurrection,Christ’s appearances & the descent of the Holy Spirit. It’s entirely up to you to observe the Sabbath, bearing in mind those who serve in the military, emergency services , the police or even those who work in the energy industry (every time a light is switched on, let alone your TV) etc …. Christ never overturned the Sabbath, He simply taught how we should observe Sabbath observance while being merciful, healing others etc. The Bible never hints to a significance to the 1st day or Sunday observance and the Resurrection, however Scripture is clear on that Baptism symbolizes the Resurrection. But according to the old laws NO work of any kind was to be carried out on the Sabbath (mercy or not) as it was a day of rest, no ? No, the Bible does not say specifically that the 1st day (Sunday) was to be a day of observance of Christ’s resurrection and other aforementioned miracles … but since these miracles happened on a Sunday, the early church logically made Sunday into a day of observance of the Resurrection first & foremost. Luke 13 has Jesus doing miracles on Sabbath & clarifying what “no work” means. Giving mercy, healing, & doing God’s will is ok. Ex. 20:8-11 says it too, “6 days shalt thou labor & do all “thy work”. Meaning, there was never an issue with the day, only an issue with work. So, do you condemn the folks who provide you with electricity for your homes, the hospitals,or switch on the TV and watch those who work to provide you with the programs you dearly watch ? Easy there, and i cant condemn anybody. And you? No, but I do believe in practising what I preach. Do you ? What makes you think I don’t? It’s not for me to judge, you will have to answer that question yourself. Was the Sabbath just for Jews? The short answer to your question is “no”. This question has been posed many times and I am sure you can search the answer for it on the internet. Exodus 20:8-11 says Sabbath is for the “stranger”. Oh dear … The Sabbath is God’s Sabbath and is made for man. Nowhere in the Bible does it say it’s Jewish for only for the gentiles. Do you know what “Sabbatismos” means in Hebrews 4:9? If I remember correctly it’s about rest ? But ask yourself what Jesus taught about “the Sabbath was made for man and not man for the Sabbath” means ? I am sure you will come to understand it’s OK to do merciful work, right ? If so, then should we oppose those who watch TV or use electricity in their homes ? Are these folks not aiding and abetting those who work on the Sabbath, and colluding with those who break the Sabbath ? And that’s not to mention those who are in the military …. I am in the UK and it’s almost 4.00 in the morning so I am off to bed. Goodnight & God bless. There are clearly 2 issues here, the first is keeping the Sabbath on Saturday , and the second is keeping it a rest day. I have no problems with anyone keeping the Sabbath on Saturdays , but can anyone honestly say it is a rest day ? If not, then keeping the Sabbath on Saturdays is nothing more than keeping Sunday a day for devoting it to Christ. As a Catholic, I follow the Catholic Church teachings & traditions even if you may find it “counterfeit”. No, I never said Sunday was a rest day. the article does which I do not agree with. However, Sunday (in Catholic traditions which are apostolic ones) has been set aside as a day for devoting to Christ due to Christ’s resurrection; his subsequent appearances ; and the descent of the Holy Spirit as reasoned by the early church. Can anyone honestly say it is a rest day ? God says it…repeatedly. Jesus kept it, as His cus on was. The apostles kept is 85 time in the Book of Acts. Yes, but you’re missing my point, my question is : does anyone honestly keep it as a rest day ? Think about it, everyone is colluding or aiding & abetting those who work on the Sabbath for the aforementioned reasons. If we are colluding with those who break the word of God, how can we preach the word ? The Holy Spirit empowers Saints to righteousness, which is to do right/right-works…by faith. This means that instead of doing the work myself, I let God work in me…by faith. 6 days shalt thy labor & do all thy work means we get 6 days to do our own work, as in hustle for money, even while we represent Christ…by faith. But the 7th day is holy, hallowed, sanctified, as in “set aside for a holy purpose”. The Sabbath is a full day to have worship, meaning, songs/words of praise, prayer, Bible study, laying hands/visiting the sick, teach, preach, baptize etc….by faith. If we truly have faith, God will give us power to do His type of work. If we truly rest in Him, His Spirit will cause us to obey Him…by faith. All very well and said, however I wonder how many people get paid for the so-called merciful work (which they may claim to represent Christ) or collude in paid-work on the Sabbath ? If you don’t want to use electricity, collude in paid work, nor get paid for merciful work on Sabbath, then don’t… by faith. You are again missing the point. My point is how can anyone preach the word of God while we , at least in the secular West, are all participating in breaking the Sabbath ? One could do a ministry within walking distance of their home. The answer to your questions is love. What is the most loving aim or goal we can have? Well, I’d watch tv if it’s focused on nature and Bible study. If I work as a cop, firefighter, nurse, doctor, military, electrician etc, I would simply ask for Sabbath off…that’s doing my part. My bosses then has to do their part by giving me the Sabbath off. Whatever I do with the money that I get paid for working on the Sabbath is between me and God. Personally, I would give God my Sabbath day earnings by supporting the church ministries that appeal to me. i) Watching the TV on the Sabbath still involves collusion with those who work on the Sabbath to provide you the service you need, hence helping others to break the word of God. ii) Even the people who work for the emergency services get paid for their work. Hence it cannot be called merciful work, for true mercy cannot carry a price tag. iv) I don’t know of may bosses who can be that understanding if you have to take the Sabbath as a day off- work ? I don’t know how employment law & religious tolerance is in the US ? Here in the UK, if one were to apply religious beliefs to work one would soon find oneself unemployed. You have your views, I have mine, & there’s nothing I’ve seen written that definitively gives me a “thus saith the Lord” on this 1″. Still, there’s more than enough written to keep the Sabbath commandment. Unemployment is the “buy & sell” part of the Mark of the Beast. Preaching the Sabbath commandment is one thing, practising it is another. I am not against keeping the Sabbath but I have not seen anyone being able to enforce it. I agree however that unemployment is a scare tactic that is “the mark of the Beast” , and hence tempting people away from God. In my opinion, Jesus was referring primarily to acts of mercy. I don’t know if the practice of the Christian Sabbath should end there or not, but I think that is primarily what He was getting at in His comments. For instance–He said that if an animal falls into a ditch on the Sabbath, wouldn’t you help get the animal out? And He mentioned that David ate the food he was forbidden to eat on the Sabbath at a time in which David was in danger of his life because he was being pursued by Saul. So, I think Jesus primarily was referring to emergency opportunities requiring that we show mercy. JMO…Peace. No, Jesus was speaking in general terms as he was being tested by the pharisees. just as priests give sermons on Sundays, medical services work on Sundays, the police etc … we see a swath of people who work and get paid for their services. Sermons are of course appropriate to Sundays; crime does not suddenly stop on Sundays, and medical emergencies of course occur on Sundays [He Himself healed others on the Sabbath]; so I don’t see how you have refuted my idea that Jesus was speaking about the requirement to show mercy on Sunday being more important than rest. However, He gave no examples about how it was necessary to buy and sell on Sunday in support of His explanation that showing mercy was more important than resting on the Sabbath. So I think that you have a more difficult time justifying those kinds of things on the Sabbath, if you are a Christian. But, if you disagree with me, then how to you propose that the Christian sabbath be observed? How should we treat it differently than the other six days of the week? I do not refute the idea of practising mercy on Sundays but accepting a stipend for the work is still paid work. If it were done in mercy no money should exchange hands, no ? Precisely because Jesus never gave examples of buying or selling, we must not assume that a complete ban on any form of transaction where money is exchanged should be what Jesus was saying. The Sabbath is by origin a Jewish tradition which we, as Christians, just followed. It was designed as a day of rest for Man, but not as an imposition. In many work places, the 7-day work practice is still in place but the day of rest is not necessarily on a Sunday. In principle mercy can be repaid with money, but I won’t quibble about that because I want to respond to your larger point that people in the police and medical professions and such are required to be there and it’s a job for them. That is certainly true; but I think we as a society can recognize that and allow that to occur without thinking we are violating the Christian sabbath if we realize that the point of having people work on Sunday is for the purpose of making a more merciful and just society. So, I think Jesus would approve of that as a general matter at least. I am not assuming that because Jesus never gave examples of buying and selling that a complete Sabbath ban on that exists. That is going too far. But I think that, because He didn’t mention anything like that, the burden is on those who believe such acts conform to permissible Sabbath activity to demonstrate why they think such behavior is ok on the Sabbath. I don’t think we can assume what you are assuming: that just because He didn’t explicitly ban such things, that therefore they are permissible. So far, I haven’t seen you propose any argument that justifies it being permissible. Finally, it is incorrect to reduce the Sabbath to merely a day of rest which one may take at any time during the week. Sabbath observance on the actual Sabbath day was originally a divine command. Christianity changed that to Sunday because of Christ’s resurrection on Sunday. The new Sabbath day instructs us that we will one day rest from our earthly labors in eternal paradise as a result of the rest that Christ earned for us, praises be to God. It is certainly appropriate therefore that the Church moved the Sabbath rest day to Sunday. The legitimate question still remains as to the details of observing it and that is why I am glad to be having this discussion. Peace…. True mercy – regardless in any form must be FREE otherwise it cannot be mercy – therefore should never entail a fee.The emergency services, police & the priesthood are just some of the examples, there are others such as the army. Moreover, if we allow these paid professions to occur then we cannot in principle ban any other form of paid work. Furthermore a merciful society depends on ALL participants to understand the nature of mercy and to practise it 24/7, not just from obeying the Sabbath for being a day of rest and worship – this is the point Christ made in Mark 2; 27-28. If I read you correctly it is up to the individual to decide whether the type of work he/she does is permissible on the Sabbath ? Then surely to be an observant of the Sabbath or not as the case may be is entirely up to the individual’s conscience and the type of vocation – are you not contradicting yourself ? Since Christ did not explicitly say paid work is NOT permissible on the Sabbath , the argument cuts both ways, and I equally have not seen any reasoned arguments from what you have said to keep the Sabbath as the day for rest. In fact, the argument for work is there in what Christ said in Mark 2 : 27-28. As said, the Sabbath is originally a Jewish tradition and although it is enshrined as one of the 10 Commandments but Christ has clarified its original intended goal by God. Although the Christian Sabbath , as you put it, occurs on a Sunday after his crucifixion but this strictly is about Easter – the remains of other Sundays in the year do not apply. I would be more than happy to continue this discussion so to further one’s understanding of the intentions of our Lord Jesus Christ. Mercy is free when it is given; that doesn’t mean it can’t later be recompensed. If I save you from drowning and lose my boat, can you not offer to repay me for my loss? That doesn’t mean you must but that is just to say it is possible, which is all I said about that. I have never paid a priest for absolving me. Nevertheless, ‘the worker is worthy of his wages.’ Even people who show mercy need to live. That means it is reasonable to compensate them. But, that doesn’t mean we can jump to the conclusion that any acts which are paid for are all the same and licit to be done at any time. You misread me. I did not say it is up to the individual alone to make the determination as to what is right or wrong to do on the Sabbath. I said we should have a reasoned discussion about it in order to determine what is right and wrong. I don’t claim to know all the answers; and I welcome the discussion. Again, I think that Christ’s words about the Sabbath exceptions only being in the context of merciful acts supports putting the burden on others that would extend the Sabbath exceptions to any otherwise licit acts. I think also, the tradition of Christian civilization supports looking at things that way. As I said however, just because the burden is on those arguing that Sabbath exceptions should be extended, doesn’t mean the burden can’t be met. Obviously, what constitutes ‘mercy’ is a fluid category. So I admit that there is room for debate. Remember however, that in the time of Moses, a man was stoned to death simply for collecting firewood for his family on the Sabbath. I consider that to be a very strong warning to us not to take the observance of rest on the Sabbath lightly, or to easily think we can do anything we want on the Sabbath, just so long as we rest one day a week, based on our personal convenience. Peace and may God enlighten us all as to how best to fulfill His commands. You may not pay the priest directly from your pockets but the Church pays him which is still a wage. Any labour where money or favours are forms of compensation – whether services or goods are rendered – is still paid work and thus the same. As for the Christian Sabbath being every Sunday and not just Easter, this I will check . As far as I understand the catechism of the Catholic Church I have not seen any evidence of it being applied to every Sunday, but will check with my local parish priest. Precisely due to the nature of mercy and how one defines it, we must not impose the day of rest or the Christian Sabbath on people. For if one form of paid work is allowed then there cannot be a ban on others, no ? The thing about Mosaic laws is that Christ has replaced (most) them with a new covenant. many Mosaic laws applied only to the Jews & their traditions, while Christ’s ministry is open to gentiles. Moreover, stoning people is a violation of one of the 10 Commandments.During the time of Moses stoning of people was instituted only due to men’s “hardness of heart” that such practise was allowed. Do not priests give us acts of mercy? If acts of mercy cannot be repaid, and since priests receive compensation for their role sufficient for their bodily maintenance, then, according to your logic, they are not real acts of mercy. I do not agree. St Paul teaches us that the law still has a role: to show us sin. He states that the things that happened in the past are there to be an example for us, so that we might not do the things that some of the Jewish people did. We should therefore take heed of those lessons. Stoning is capital punishment and is a matter of justice. Today, the Church does not teach that it is unjust to commit capital punishment. Rather, it is a question of doing better than capital punishment. Just as Christ showed mercy to sinners, desiring their repentance, the Church teaches that it is better, where the state can prevent the wrongdoer from harming others, to let the person remain alive, in the hope that the sinner will repent and do good deeds. Imposing the Sabbath as a matter of Church law is one thing; as a matter of civil law, another. I agree, as I said before, that it is difficult to decide how exactly the Sabbath should be imposed on society, especially in societies with great religious diversity. So, as Catholics, we have to do our best to decide what God wants us to do and to avoid on the Sabbath. The Church only gives us guidelines: attend mass, avoid menial labor. But define avoid–aren’t there some menial things that are ok? And define menial–aren’t some acts menial in some context, but not menial in others? So, without laws, we have to do our best. I think the goal ishould be to think about it enough so that we could come up with some good laws. Hope you are having a good Sabbath : ) Peace. Your website only acknowledges the authority of the Bible. It does not acknowledge the authority of the Church. That is the same principle enunciated by Luther, sola scriptura. The Catholic Church does not preach sola scriptura. The Catholic church believes Christ gave it the authority to bind and loose, to preach, teach and govern. Exercising what it believes to be its God-ordained authority, the Church changed the Sabbath practice to Sunday for Christians. If you accept Church authority, you should therefore also observe the Sabbath on Sunday. I will forward your thoughts to my parish priest and see what he has to say. As for keeping Sunday as a day of rest and for worshiping God only, I believe it’s unworkable and contrary to Christ’s teachings. BTW, I am a Catholic. I’ll be interested to know what the priest says; please let me know. The article which we are responding to definitely does not suggest what you are proposing. Moreover, apart from acts of mercy which are considered to be “licit” there are others which are equally “licit” but not necessarily merciful. Next time you buy food, newspaper, switch on the TV /radio or put petrol in your car on a Sabbath are you not aiding and abetting paid work on a Sunday ? Yes. And for the reasons I have already put forth, it might be a more faithful observance of the Sabbath to abstain from doing such things. That’s ok. We are entitled to our opinions. That’s true. Which are licit, and which are not, is precisely the interesting question, which we ought to think about. But we should not reason backwards from the facts to determine what is licit in principle. If everybody murders, does murder thereby become morally licit? So, you cannot reason in that manner. You cannot say ‘this is what people do on the Sabbath, therefore it must be morally licit.’ You have to think about what is right or wrong, then govern your actions accordingly; not vice-versa. The Catholic Church explains it like this: To hear Mass and No unnecessary servile work on Sunday. Unnecessary says alot. Servile means more like a labor of the body versus the mind. Seems like that definition leaves a lot be desired. For example, would working in a nuclear plant to provide electricity be considered as “servile” ? If necessary, then servile does not apply. For example firemen, policeman, nurses and doctors. In the Bible, Jesus asked the men criticizing him for healing on the Sabbath by saying “Would you not get your donkey out of the ditch if it fell into it on the Sabbath?” Each man has a conscience. Examine it and make up your own mind. I made a request to two different employers to schedule my Sundays off. Both complied, even though the one supervisor made rude remarks about it. My daughter did like wise and got Sundays off. It takes courage and you may not get your will, but if you can, you should ask. Hence from what you are saying keeping the Sabbath is not a hard and fast rule (just as Jesus said) which is my point. Moreover, Sunday is not the Sabbath. Plus most workplaces do operate on a 7 day rota where the 7th day is scheduled for rest , although it may not fall necessarily on a Sunday. Paul, now you are pushing the envelope. Sunday is the Sabbath. You are to keep it holy by attending Mass and by avoiding all unnecessary servile work. You don’t get to pick another day to be your own special day to keep holy or therefore you are making up your own religion. The Catholic Church has even extended the Sunday obligation to hearing Mass on Saturday evening vigil of the Sunday. Donna, Sunday is NOT the Sabbath – please check your facts. The Sabbath is from Friday to Sat. Sunday is the first day of the week ! We go to Mass on Sunday to commemorate Christ’s sacrifice etc … Please check and verify for yourself. Yes, the Church has extended Sunday to hearing Mass & on vigil on Saturday for those who cannot attend Sunday Mass , however the Sabbath is NOT on Sunday. The 7th day Sabbath is supposed to serve mankind’s need to build a relationship with God by taking time to focus on love and worship. However, there are extreme instances where the letter of the law becomes so burdensome, that the purpose that God intended for the Sabbath is lost. Helping the lame to walk (for healthcare workers), firefighting (for firefighters), crime fighting (for cops), are then permissable if done in glorifying God. Right-on, that’s what I was hinting at if you read the rest of my posts. fyi…economics 101 : Chik Fil-A is closed on Sundays. Their byline: ‘The Day is worth more than the dollar!’. ps – they are not hurting financially. Noble & rightful for them to set the example/standard. Many would do well to follow. “Sabbath made for man, not man for the Sabbath”. i think it shows how God knows His creatures (us). He does not need our worship. He knows that we need it, that without the commandment, we would ignore Him (as we do now, as we get busier and busier, we get farther away from Him Whom we need) It’s for us! Hobby Lobby is another thriving business which is closed on Sunday so that their employees may attend worship services and spend time with their families. 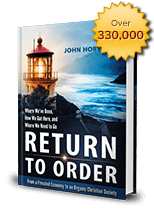 There is an Almighty Hand behind this book because of the truth within the words of “Return to Order” and it is the voice of our Creator Who is showing us the way to return to the virtues He put within us. This book is a sign pointing a way for all of us to return to the ways of God which are far above our ways and thoughts. God bless John Horvat II and those who have supported this work worth taking into account for fruitful lives filled with peace and love. When Jesus said He was Lord of the Sabbath, he was talking as a Jew, and it wasn’t Sunday. Neither was John since he wrote Revelation for Jews. This is another ant-religion law that will start more controversy. Germany is not a religious country, BTW. If Jesus was talking as a Jew, it would be blasphemy to say He’s “Lord” of anything. Jesus talked as God, and He was consistent with all of the Bible references to the Sabbath. Which day is the Lord’s day? Isaiah 58:13-14 answers that. The 7th day Sabbath command is for the same “stranger” in Exodus 20:10 is same Non-Jew as in Isaiah 56:6-7. God says the Sabbth is His day in Isaiah 58:13. God never said sunday was His. Many sports activities take place on Sundays obligating families to take part because their son or daughter is part of the team. It seems like a trap. Lord deliver us! If you think about it, while the family “rests” and watches Sunday football (or any other sport), the players, refs, tv people, concessions folks, etc. are all working! Yes, professional sports, but schools and youth sport clubs arrange competitions on Sundays and too many parents have caved to this putting pressure on other parents to “think of the team.” Of course, the child is also pressuring. Sunday is 1 of the 6 days that God gave us to labor and do all our work. MK We all need a break – Sunday is a day of rest and a day to thank GOD for all our blessings. Pay a visit to your Church on Sundays and your week will be blessed. The Bible never refers to Sunday as a day of rest. Isaiah 58:13-14 proves a blessing in keeping the Sabbath (not sunday). Even in the James Bond movie Goldfinger, someone said to Mr. Goldfinger banks don’t open on Sunday. Sunday should always be a day of rest because Sunday belongs to God. Which god does sunday belong to? I ask because in Isaiah 58:13, God clearly refers to the Sabbath as “My holy day”. I refuse to work on Sunday. I will not accept a job that requires work on Sunday. That means I don’t shop, mow lawn, clean house, wash car, transact any business, pay bills, fix a door hinge, change a burned-out lightbulb, groom the dog…none of it. If more people–a LOT more–would refuse to shop–@ Walmart, the supermarket, retailers/the mall, wherever–not eat @ restaurants, go to laundromat, buy gas, go to a theme park/zoo/other entertainment venue…any of it, that’s truly unnecessary, these places would close on Sunday, for lack of business. You CAN do without doing any business on Sunday–I’ve been doing it most of my life. I lived in Germany for 6 years, & loved every minute of it–except for the language & the cuisine–they are 0 to write home about!–but there & everywhere else I traveled to in 16 other nations, businesses were CLOSED on Sunday, except for those that cater to travelers & tourists, like hotels, & some modes of transport. Souvenir, specialty shops like chocolate, lace or wine, clothing & grocery stores, MOST restaurants/cafes, except during tourism “high season,” or during major festivals (Oktoberfest, anybody?) are all closed on Sunday. I loved it. Employees got the day off to spend how they wanted to, unlike here. If businesses were forced to close on Sunday for lack of business, employees @ them would get the day off here too. Think about your real “need” to spend any money, transact any business, on Sunday, when your doing so necessitates the staff @ the establishment to be there, on SUNDAY. How about this as an alternative to shopping/dining out, etc., on Sunday? Visit a sick person in a nursing home or hospital, or pay a visit to someone in jail or prison, on Sunday. Perform a corporal act of mercy, instead of a worldly act of commerce. Those sound like some lovely memories, Cheryl. You might be able to listen to some beautiful hymns by searching for them on Youtube.com. There are plenty of old songs to listen to on there. Especially religious music. God Bless you and your family, Cheryl. Disney is definitely out, doesn’t support Christian values anymore. You mentioned Walmart, so I am making a comment.I am 74 yrs. old and have to work to live as my social security does not support me. I work at Walmart and have ask several times to be off on Sunday and was told that is the busiest day of the week and if you can’t work the maybe we need to get someone that can. It is at my age to work late on Sat night and get to Mass on Sunday and go to work and work late on Sunday night. I need my job and like it but suffer mental anguish over the long weekend hours. Just pray for me to be able to get a change in my life,because i’m going to ask again soon. Whilst this is a fantastic article, I am so surprised that the Apparitions of Our Lady of La Salette have not been mentioned in this article, nor by any commentators. There, Our Lady lamented the erosion of the observance of the Sabbath rest. Also, I quote ‘ Back then, the seventh day was generally dedicated to God and those relationships that really matter’. We as Catholics worship on the First day (well, everyday really), not the Seventh as do the Jews and Seventh Day Adventists etc. This is due to the fact that the early Christians worshiped on the First Day of the week in honour of the Resurrection of Our Lord. I Don’t choose to shop or go to a restaurant on Sunday. If everyone, or at least a majority, did the same, we would force those business to close. I think the answer is personal responsibility to end “frenetic Intemperance,” not legislation. The bible says “neither you manservant nor your maidservant shall work on the Sabbath”. Who is our manservant or maidservant today, but the clerk in the store or the waiter or waitress in the restaurant? The second half of that is for Christian employees in retail to enforce their religious liberty and redeem their faith by refusing to work on Sundays. I’ve had employers try to scare and harass me into working on Sundays, but I know my Civil Rights and I call their bluff every time. As you said, if everyone, or at least a majority, did the same, we would force those business to close. Whether its because they’re short on staff or the customers just don’t show, business conducted on Sunday needs to be made difficult and unprofitable. That starts with employees having the courage to say “no” to the threats, harassment, and exploitation of their employers! I don’t choose to shop or go to a restaurant on Sabbath, and sunday is not the Sabbath. Since When, do you know what Sabbath means for the Christians that follow the new covenant, not the covenant of the law of deaf! Did not God rest on the seventh day? I like Kiko Arguella’s song, “Day of rest and holiness were given to your people” As the founder of the Neocatechumenal Way, he encourages Sundays dedicated to family prayer, Bible reading and sharing and family (or community) meals together. It’s a good positive influence in the Church. Sorry but Sunday is not day of rest because is not the seventh day and is not holy. Read the commandments in the Bible. . Since creation God made and nlessed the 7th day to rest; actually it was the only day with a name, SHABBAT or Sabath. And Jesus, who “made all things new” rose from the dead on Sunday. He rose from the dead on Sunday, because He had rested on the Sabbath. Setting and example for us, even in death. told them NOT to lay upon the Gentiles any greater burden than THOSE ESSENTIALS. Making all things new didn’t make Sunday the new Sabbath, that’s un-biblical. Rest is “Sabbatismos” in Hebrews 4:9, meaning there remains a “keeping the the Sabbath” to the people of God. You are free to rest whenever you want. Merry Christmas! So are you. You’re not being very charitable. You can believe what YOU want to believe, and I’ll stick with what I know from the 2000 year history of my Church. Resurrection Day or Sunday is Thee Eighth Day of the week- a brand new day- The new Sabbath of Jesus Christ. The Alpha and the Omega (the first and the last) It is biblical. The number eight is a very biblical number mentioned in many different ways in the Bible. The sign of the Old Covenant was circumcision and was done on the eighth day, eight were saved in the ark and many more. If it’s Biblical, please give a Scripture. I’ll read it. You need to get yourself a good Catechism and read it and learn the Catholic faith if you are or want to be a Catholic. The Catholic Church is like a three-legged stool that rests on three legs: Scripture, Tradition and the Magisterium. Jesus established A Church and gave Peter the keys. Who has the keys has the authority. Jesus told Peter “Whatever you bind on earth, I bind in heaven. Whatever you loose on earth, I loose in heaven.” That means God backs up Peter. Peter and his successors together with the bishops teach what Scripture says and means. The Protestants don’t want to submit to Peter. Their churches are man made and to prove it, they have split into thousands of denominations because they still can’t make up their minds what they believe and what is the truth. They left the truth when they left the One, Holy, Catholic and Apostolic church. They only have pieces of the whole because all they want to go by is the Bible (sola scriptura-which is NOT BIBLICAL) Jesus said to the apostles “Will you leave me too?” when some of the disciples said His teaching was too hard. You know the one, the teaching that said “unless you eat my Body and drink my Blood, you have no life in you.” Peter said “Where would we go? You have the words of Life.” You need the Church to teach you. We are in The New and Everlasting Covenant. The Catechism of the Catholic Church (magisterium) teaches what is in the Bible together with Tradition. Get one and study it along with the New Testament. God Bless. Catechisms cause more confusion, like bowing to popes, bishops, and other idols. Peter would say, “Stand up; I myself also am a man.” See Acts 10:26. Also, Bishops & Popes “claim” celibacy, but really should say they “try” to abstain. The true gift would result in true celibacy…like Peter? Nope! …like Paul. Yep, Peter was married. See 1 Timothy 3:2; Matthew 8:14. Are you a Seventh Day Adventist? You realize that this is a Catholic site? Why are you being so argumentative? Why are you making a response on a one year old comment? We’re free to comment whenever we want! Absolutely. But you made known your opinion about five times here. Law, so that we might become God’s sons and daughters. human nature by sending his own Son, who came with a nature like sinful human nature, to do away with sin. Since Sunday isn’t the “seventh day” what does this say to Jews and others who need to work on Sunday? Isn’t it religious discrimination? We deserve a religious freedom of choice, and this does not encourage it. http://www.saveoursundays.blogspot.ca/2016/01/why-we-lost-bonding-as-family-and.html I agree with this article 100% . We need to slow down as a society and enjoy rest and bond with our families. We can do it by not shopping on Sundays, We all must join together and spread the word, Our society needs a day of rest! God gave us a day of rest in Genesis 2:2-3. Man-made Sunday rest = by works. God made Sabbath rest = by faith. Meaning, Sunday is NOT a day of rest to God nor in Scripture. We should rest the Sabbath (not Sunday). The early church didn’t rest on the Sabbath, were they mistaken, even the apostles! See a quote taken from the Didaque of the early church. your transgressions, that your sacrifice may be pure. No need for Didache. The Scriptures speak for themselves. “One man regards one day above another, another regards every day alike. There you have it New Testament, The one you refuse to follow! It depends on what calendar you go by? It’s amazing people you have to wake up. Corporations are destroying Christianity! Playing one religion off against another to get what they want. The majority of people are off on Saturday and Sundays while low income workers that work in stores have to stock shelves on the weekend, while Christians are out shopping. Their should be one day a week everything non essential shuts down. Churches do not preach any more about the Sabbath …and I do not see any preaching being done about Saturday or Sunday? What loving God would expect low income earners working all weekend because you can not agree which day to rest on? Whether you are religious or not…the point in being you need time off to be with you’re family. A common day off. That would be Saturday or Sunday. Why is my groups Save Our Sundays,,,? Because Sunday was that day we all had off to be together. We had a democratic vote in Nova Scotia Canada and we said No…what happened? Our government chose to ignore our wishes and opened the doors wide open to Sunday shopping. Is this democracy? What are Christians doing? After church going out and going shopping. Church members are getting smaller. No young people are going to church, they are out working because they fear of losing their jobs to go to a church. BUT wait….people need time to bond and spend together. You can not do it if you do not have a common day off. If you do not go to church and this was the case for many Nova Scotians they lost that day as a family to be together. Yes other occupations had to work like restaurants, Coffee shops, gas stations etc. If they have to work on a Sunday we were told, what makes you any better? First off these places are non essential services, even gas. You can buy gas the day before, you can get a coffee or buy some to make home. Government and media scammed the people playing one occupation off against another. Why should Jill in a grocery store work on a Sunday because Jack works at Tim hortons on a Sunday? Why should Jill buy a new car because Jack bought one? Why would you jump over a bridge because someone else did? Families do not bond any more and we wonder why? Sure internet, texting etc isn’t helping but we do not encourage families any more to take one day off a common day. All those other non essential services had the option of lobbying government so they too could have had Sundays off. The government and the media made people that was off on Sundays feel guilty because other people were working on Sundays. YET all of these people could have fought to have it off too. The government could have stepped in and gave them Sundays off. The same questions were never directed at government offices,banks etc who were off on Sundays, just retail workers.None of this was ever mentioned because government looks after the corporations. Corporations own the media. People you were scammed by these clowns who are making millions of dollars and destroying family life. They are destroying Christianity right in front of you’re eyes and you are helping them do it. Retail workers are people too…they breathe the same air and pay taxes like you do. It should be a basic right for all workers to have a common day off, a basic living wage just like most people do. It’s called Divide and Conquer…and the corporations are winning. Take off you’re blind folds people and see what you are doing to kids that no longer get to see mom and dad for a family dinner. YET we wonder why we have the problems that we do today in society? One last comment…YES nurses and doctors work these shifts BUT they are an essential service and they are not working for less than 15 dollars an hour. I will also note that it’s a minimum of them working these shifts where as millions of non essential workers that do not need to be working are working to feed these national greedy CEO pigs more money at the expense of low income earners. Where is the love in Christianity? To let all of these things go on in today’s world??? Judaism always kept Sabbath, so all you have to do is locate when they keep Sabbath, but keep it, by faith. Sabbath, not Sun-day is the day of rest. I am mostly in agreement, but Sunday is not the Sabbath. Friday sundown to Saturday sundown is…for everyone. Please do your research before responding. Christians have traditionally observed the Sabbath on Sunday because that’s the day our Lord Jesus arose from the dead. So we don’t really observe the Sabbath. We celebrate the Resurrection. Really, as Jesus said, the Sabbath was made for man, not man for the Sabbath. The main thing is to get one day of rest in every week to recharge our batteries and grow Spiritually. Christians adopted an un-Biblical practice in observing the Resurrection on Sunday. No Scripture says it was done by anyone. Baptism is the Biblical way to observe the Resurrection. The 7th day was made for man, to rest, recharge, & grow Spiritually. The letter kills but the Spirit gives life. I don’t think God cares what day you set aside for worship as long as you rest, draw close to Him (which we should do every day) and fellowship with other believers. Genesis, God shows work by faith in resting the 7thday, so the Spirit gives me life by empowering me to keep Sabbath, by faith. Next, Leviticus 23 list the 7th day as a convocation, or assembly day (to fellowship), but 1st day is not. Also, Paul reasoned in the synagogue every (as in “every”) Sabbath, and persuaded both the Jews non-Jews in Acts 18:4. As Christians, we are no longer under the CURSE of the law. As Jesus pointed out in the Sermon on the Mount, and as Paul said, anyone who wants to make himself righteous by the law must obey the WHOLE law (never sin). It is by grace we have been saved and not by works lest any man should boast. I knew before I read them which scriptures you would quote out of context to try to make your point. Works are proof of salvation, not a prerequisite. The just shall live by faith. If you believe you’re going to get into heaven by your works, please explain to me why Jesus had to suffer and die. If you believe the Sabbath must be observed on Saturday, that’s your prerogative. But if you are going to follow Old Testament law as a Christian, you must also be circumcised, never eat pork, catfish, shellfish, rabbit… the list goes on. The ancient Jews also allowed divorce. Jesus said to do so was to commit adultery. He also worked on the Sabbath. You can’t have it both ways! You got a problem with me wanting to obey God by faith knowing that He doeth the works? Certainly not! As I stated, the just shall live by faith! Faith in Jesus Christ and trusting in His sacrifice to cleanse us of our sins is what gets us into Heaven. If you choose Saturday as your Sabbath, that’s OK by me. Just don’t criticize those of us who choose Sunday. To obey is better than sacrifice in 1 Sam 15:22. I didn’t choose Saturday, God’s Sabbath is the only 1. And I’ll criticize whoever I want, I just choose to not to…I’d rather simply say what the Bible says. You just stop trying to tell me what to do. I’ve been reading the comments and I wonder why Chrisitians want to be Jews by observing the Sabbath as they do ? I wonder what other ordinances of Judaism do they accept and practice ? And why they want to be placed back under the bonndage of the Law, which doesn’t save them ? I read in Acts that the early Christians worshipped on the first day of the week in observance of the Resurrection. So again, why do we Christians want to be Jews ? Hebrews 8:8-12 says the the New Covenant is for Jews. Isaiah 56:6-7 say that the Sabbath is for everyone. 1) Romans 14 would be better understood with 1 Corinthians 8. “Him that is weak ‘In The Faith’ receive ye, but not to doubtful disputations.” So, the context is about new Roman converts esteeming days to their idols (not various Sabbaths). 2) Galatians 4 is a much longer study, but the context is better understand by Gal. 3:12; Lev 18:5; Rom 10:5 and more. The 2 main contrasting laws pit “the law of Works” vs “the law of Faith”. Faith without works is dead though, so the correct type of works only come by faith = righteousness by faith. 3) Colossians 2:16-17 beg 2 questions: How was Jesus’ body foreshadowed? Answer: Offering. Which Sabbaths involved offering? Only the 7th Day Sabbath did not. Leviticus 23 lists all 8 Sabbaths for further study. gen 2:GOD rested on the seventh day, GOD blessed the 7th day and sanctified it. EX 20: Remember the Sabbath day,to keep it holy, GOD rested on the 7th day, the Lord blessed the SAbbath day and hallowed it. It’s not up to us to make any day a day of rest. That’s up to God and he made the Seventh day Saturday the day of rest, yet he does not force us to keep it, so why should we enforce it? That would be taking away religious freedom!